The Best Casio Pathfinder (Protrek) for 2019. 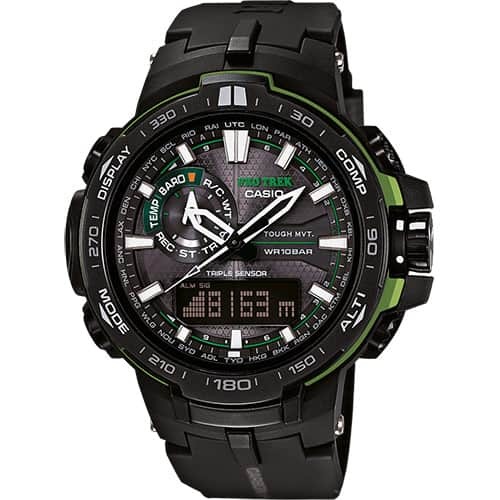 The Casio protrek series, born out of the love of outdoors, is a rebranded version of the G shock series, made of Pathfinder technology. 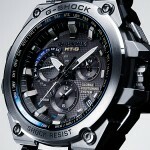 As the main G Shock series goes bigger in design, the Protrek goes smaller. Although, the protrek outdoors series was launched many years ago and several versions have been produced over the time. 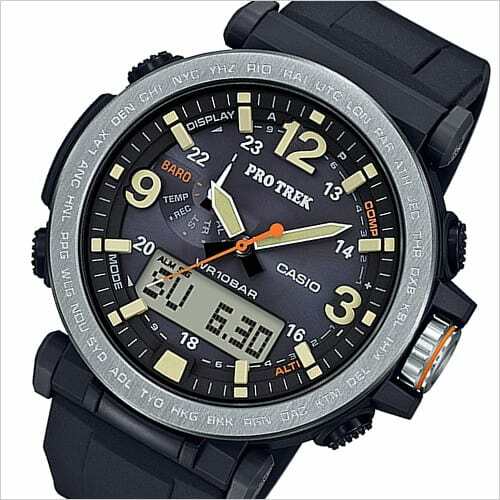 There are over 27 latest styles of the Casio protrek on sale at the moment. There are various choices you can make, depending on which feature tickles your fancy. There are four categories of this version of Casio elegant production. 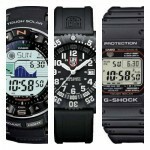 The first category has been the Twin Sensor, Solar, Solar Atomic, and the Smartwatch. We will be discussing the best 10 of the protrek series (in no particular order), making sure that all the four categories of the protrek are represented in this list. 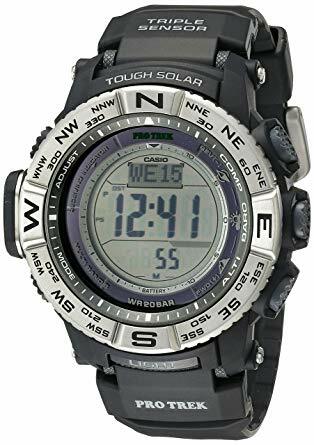 The common features to all the watches are Tough Solar Technology (rechargeable Solar battery), Triple Sensor (Altimeter, Barometer, Compass and the Thermometer) also known as the ABC sensor, stopwatch, 5 daily alarms, world time, hourly time signal, countdown timer, 12/24 hour formats, and full auto calendar. They also come in digital and analog versions (or a combination of both) because we all have different preferences, but we will try to narrow down the list somehow. 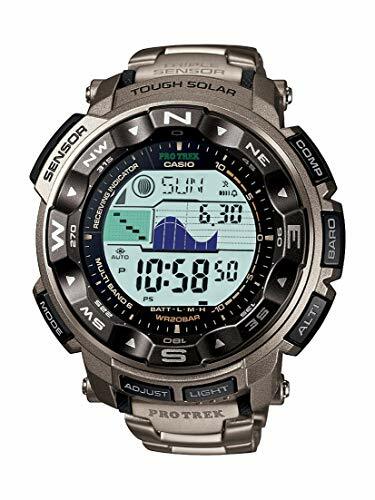 The PRG 270 is a solar powered version which incorporates the latest triple sensor version 3 of Casio engine. Advanced CASIO technology provides a 95% reduced direction sensor and 90% less sensor power usage than the previous models. Despite its small size, the new sensors in this model offer greater energy efficiency and better precision. The model measures height in increments of 1 meter (previously 5 meters) and displays compass readings for 60 seconds (previously 20 seconds). 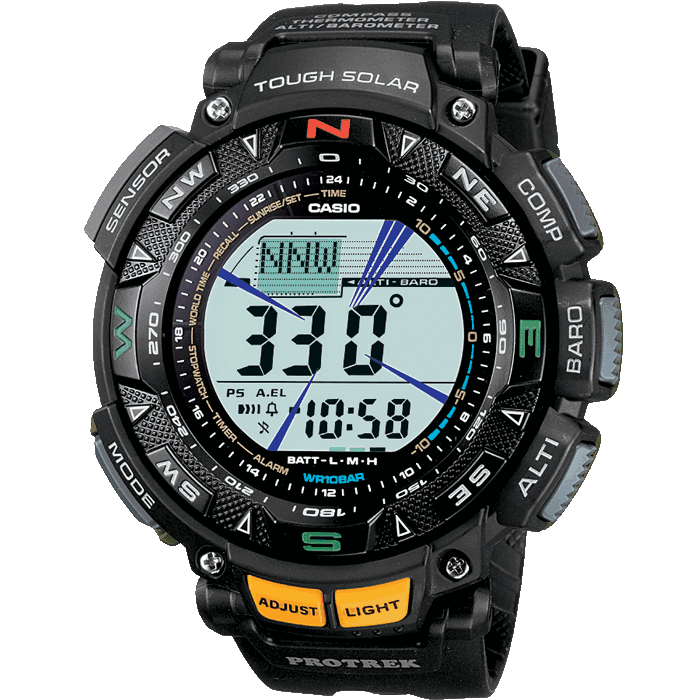 Besides the digital compass and the altimeter, the barometer of the watch contains a unique atmospheric pressure alarm which warns the wearer of sudden changes in air pressure readings. The case is designed in such a manner to withstand every outdoor condition. Large side buttons and one-touch air pressure and altitude, digital compass, and temperature readings bring to your fingertips all the important information. Properties such as Tough Solar, 100 meters waterproof and many are also included. Everything in these models has been carefully designed and built to make them important pieces of an outdoor device. The band is made of black resin. Despite all these amazing features, it was not designed to possess the Multi-Band 6. This model is on the list because it is a more affordable outdoor smartwatch compared to the WSD F20R. 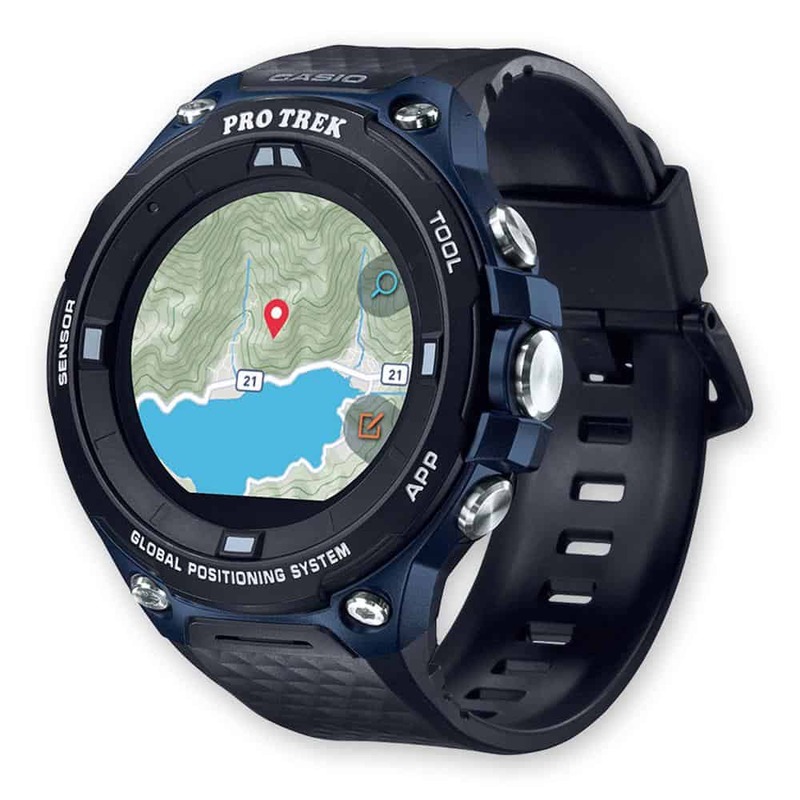 Every outdoor enthusiast should possess a piece of this model because it incorporates the google’s wear OS which allows you to easily interact with the notification from your watch and also possess some amazing features such as the power-efficient GPS and full colored navigation map, which means you can’t get lost even where there is no access to the network. The device is equipped with nine major outdoor and sports applications with global reach. Such applications are the Fishbrain, ViewRanger, Hole19, and others which are showcased on the “Featured Apps” list of the device that you can download. The band is a soft black urethane with an indigo accent and 3 large side buttons. Water resistant is about 50 meters. This model has an automatic hand shift function that moves away from the digital window when you check the readings displayed, making them more readable for a certain time of the day when the hands would be obstructing the digital display. It also has smart access, radio controlled time and dual Neon Illuminator backlight LED for both the analog and the digital screen. Everything in this watch has been carefully designed and manufactured to make it extremely easy to use and legible display. All these functions are packed in a slim 12.8 mm housing. The PRW 6000Y-1 also has sapphire glass and a resin band for excellent durability. Looking for simple yet rugged sporty timepiece? The PRG 300-1A2 is your best bet! The PRG 300-1A2 has been tagged the best budget ABC watch because it offers the best price to value index of the protrek series. It is very slim compared to others and it is the lightest of the protrek series, with a mass of just about 57 g. It has a water-resistant value of approximately 100 meters. It does not possess the Multi-Band 6. Perhaps you are not a fan of an all-digital watch, PRG 600Y-1 comes in a safari-inspired analog-digital design with big, highly distinct index and hands. 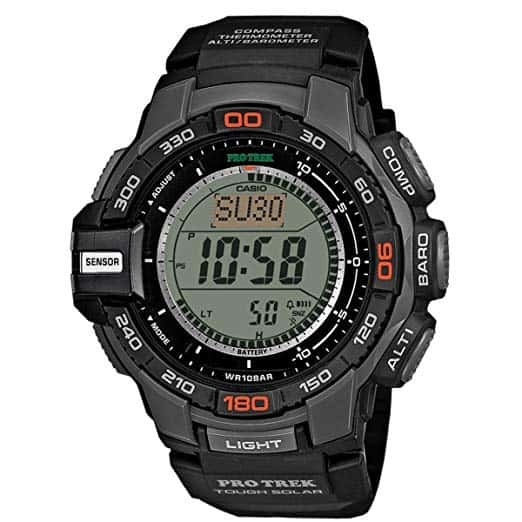 This model is perhaps the best and the most affordable analog-digital protrek watch. It is armed with an STN LCD display, Triple Sensor version 3 engine, radiant markers and hands, stainless steel bezel and dual LED lights. Band made of Dura Soft silicone for maximum comfort. The water-resistant is 100 meters. Mass of 78 grams and dimension of 51.6 x 51.5 x 13.4 mm. No multi Band 6. You can also go for the PRG 650Y-1, an upgraded version of PRG 600 series which has a 2-layer band with a luminescent underlayer and Neon Illuminator blacklight LED. 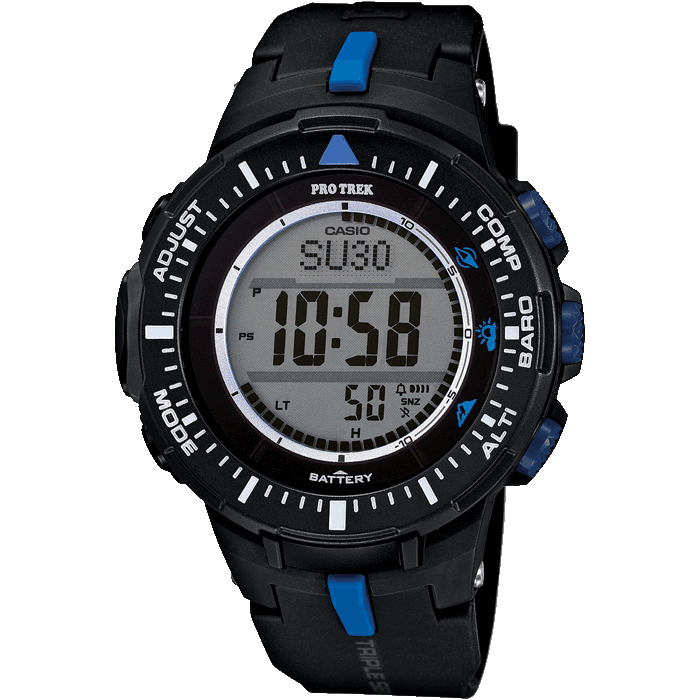 This model offers the full protrek series features with water resistant as high as 200 meters which makes it the most suitable protrek for all environments and especially for water sports. The weight of the device is 89 grams and the dimensions are 56.9 x 53.4.0 x 14.5 mm. The PRG 240T-7 protrek series will appeal to fans of G-Shock series because of the classic, rugged and clean look associated to the Pathfinder watches. It is armed with a titanium band and a duplex LCD display. The measurements are 51 x 15 x 57 mm and weight is 64 grams. It also comes in nylon and resin bands. It does not posses Multi-Band 6. 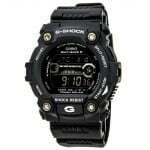 100 meters water resistant, 31 time zones of 48 cities and the city codes. The full battery charge can last for about 6 months without exposure to any ray of light. This timepiece has similar features as the WSD F20A earlier discussed. It is equipped with Bluetooth 4.1, Wi-Fi and with more efficient power usage. 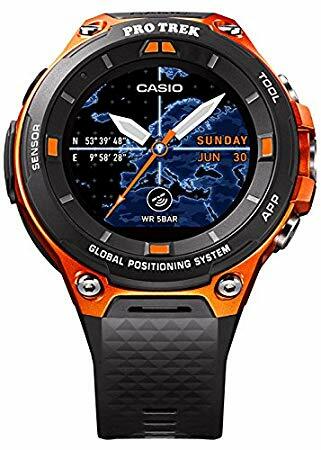 In this model Casio adds a built-in GPS module and can navigate through the maps on the watch screen in a full colored display, even when offline. It has an internal storage of 4000 MB in which you can download the maps. In combination with the Russian GLONASS satellite system and the Japanese Michibiki, the position memory function automatically and accurately registers your route and allows you to record the GPS position on your watch with a gesture. It has a water resistivity of 50 meters and a product dimension of 62 x 58 x 15 mm with a weight of 90.7 grams. This version also possesses all the common features mentioned above, but what makes them stand out are the It is armed with a titanium band and a duplex LCD display for enhanced readability. And also the Casio’s Version 3 Triple Sensor (next-generation). All the features found in this timepiece makes it an excellent choice for every passionate outdoor sports person. 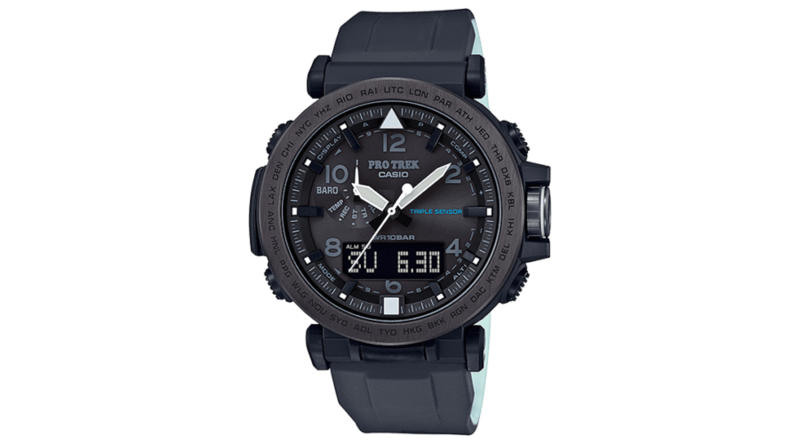 Even the most advanced adventure users could count on this CASIO PRW 2500T-7ER model, whether they are diving, surfing, rafting or kayaking. At full charge, the battery can last up to seven months (if not exposed to any source of light). The water-resistant is about 200 meters. Dimensions are 10 x 10 x 5 cm; 113 grams. We believe this list will guide you to decide your next protrek purchase! Which protrek series do you consider the most suitable for your lifestyle? Kindly share your Top 10 PROTREK wristwatch in the comment section below!